Steve and I live for cookery shows. If you pop to our house it's very likely we'll have one on in the background. Not that we ever cook any of the recipes we watch being made on TV of course but it's nice to get some inspiration. Nothing beats embracing slow living and watching Saturday Kitchen in the morning with a coffee to start your weekend. 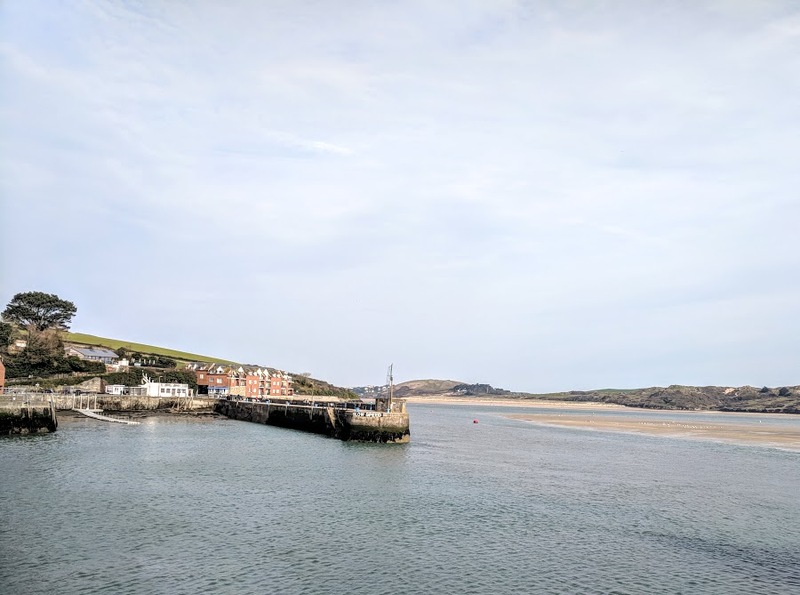 Because of this, we've watched hundreds of Rick Stein shows and Padstow is somewhere we've watched appear on our screens as a must-visit foodie destination time and time again. 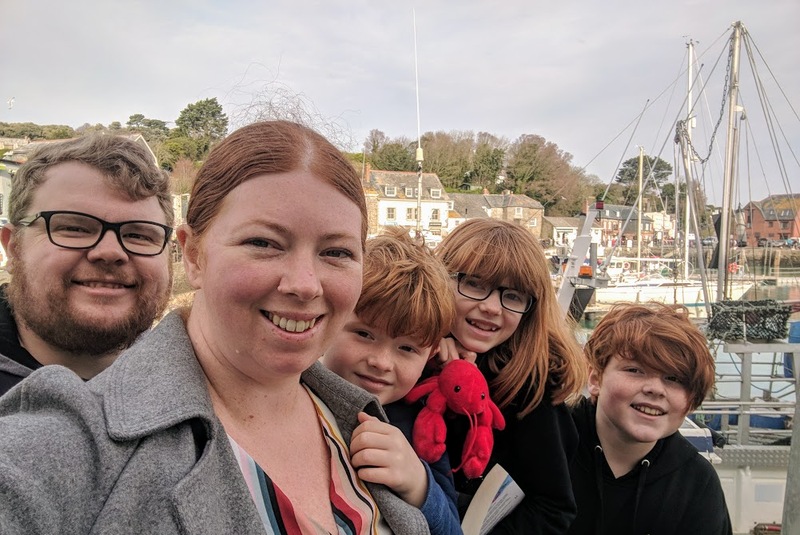 We've probably wanted to visit for around 10 years and this February, we finally had the chance during our half term trip to Cornwall. 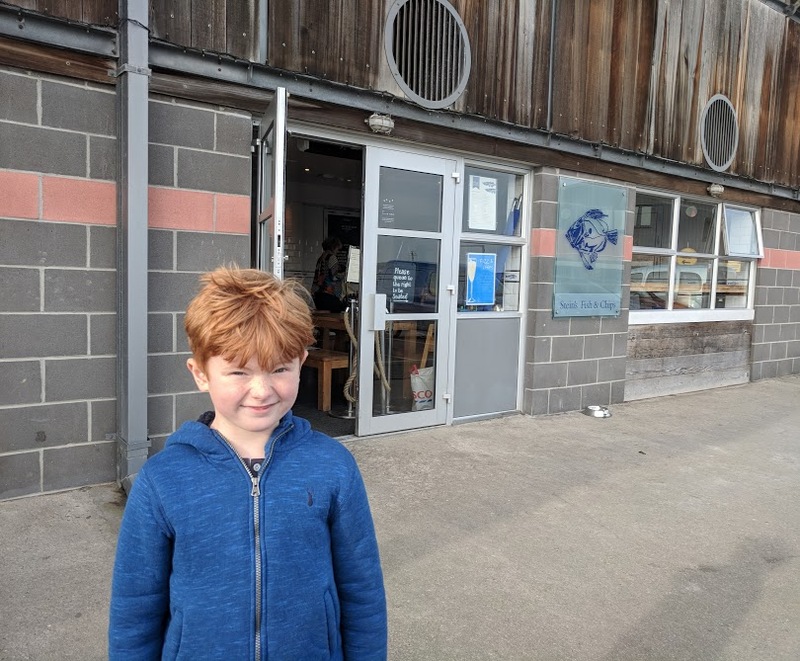 We visited the Northumberland Seafood Centre / Lobster Hatchery in Amble last year (well worth a visited) and learned that it was based on the National Lobster Hatchery in Padstow. 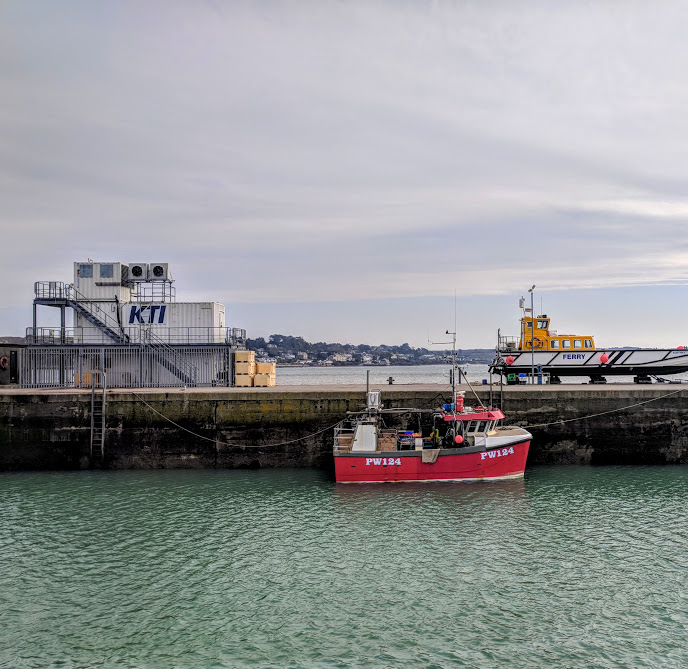 We enjoyed such a fantastic tour and learned a lot last year so were keen to see what was on offer in Padstow. We're keen to learn about sustainable food sources and visiting places like this allow a chance for both our kids and us grown-ups to learn. 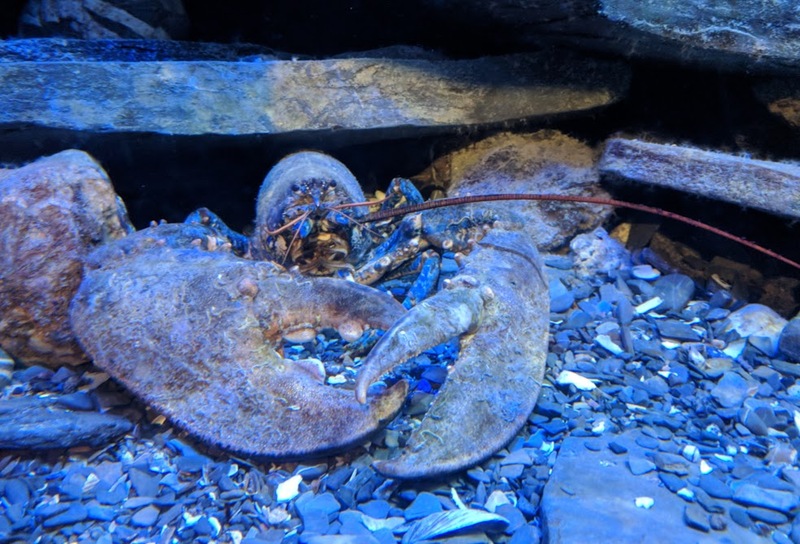 Entry is a reasonable £10 per family of 4 and the staff are lovely and took the time to share some extra facts and show the kids some of the baby lobsters that had only just hatched. 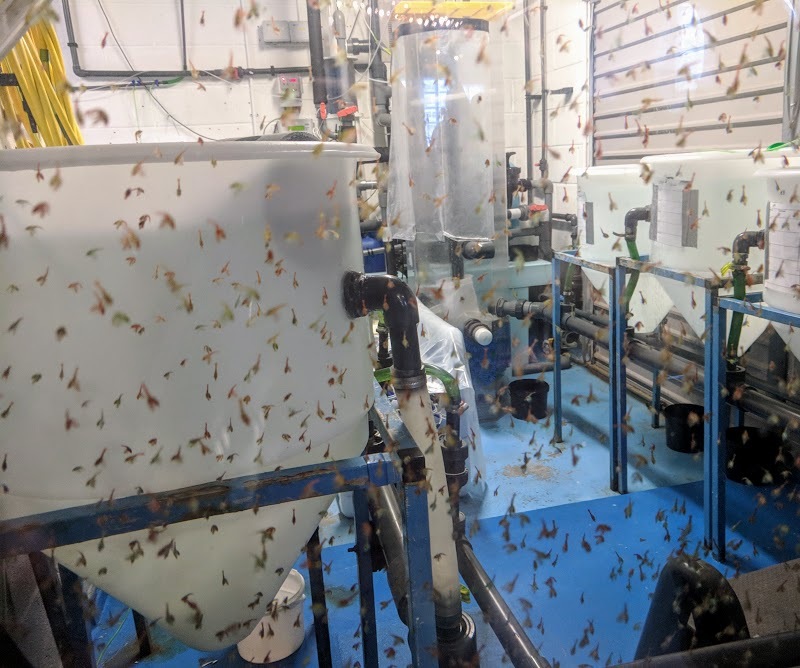 The National Lobster Hatchery in Padstow is very different to the one in Amble. 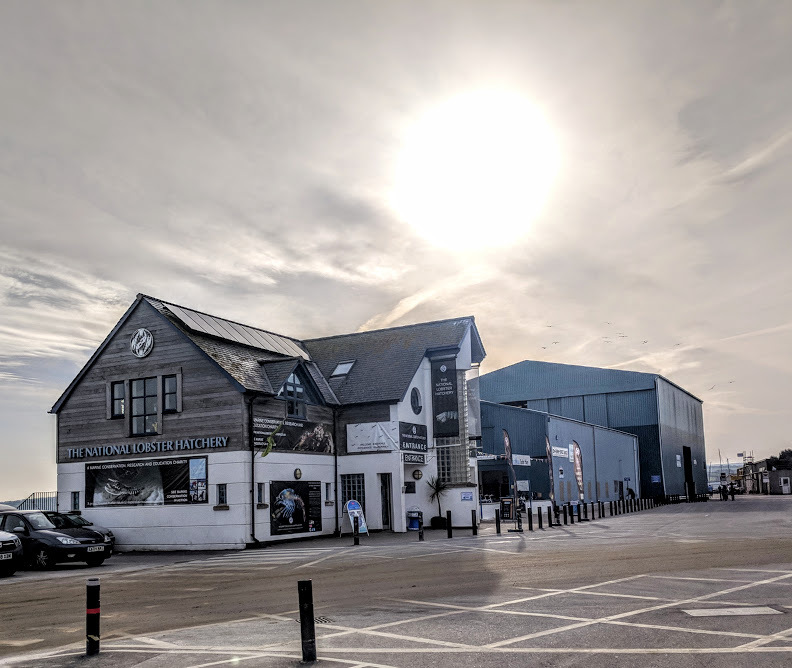 At Amble it's a guided tour around the actual hatchery where as in Padstow it's more like a museum. Both experiences are equally as enjoyable. 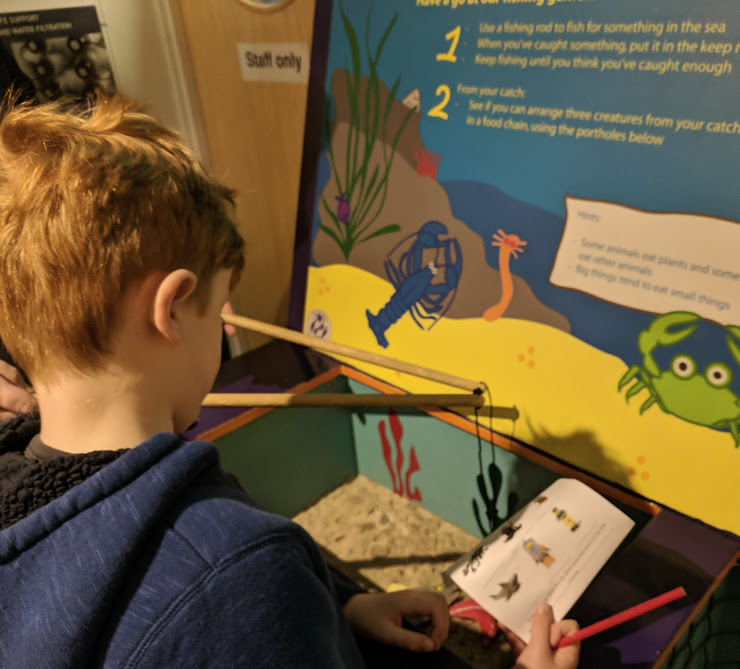 During our trip there was a LEGO hunt taking place and the kids loved trying to spot the various figures in the tanks. 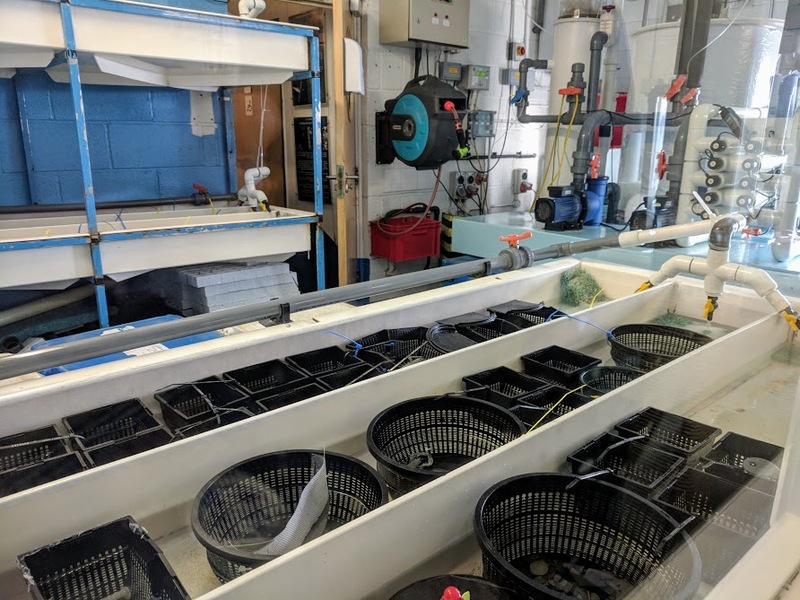 The National Lobster Hatchery is pretty small but there's a lot to learn about the project. We really enjoyed it and would recommend. 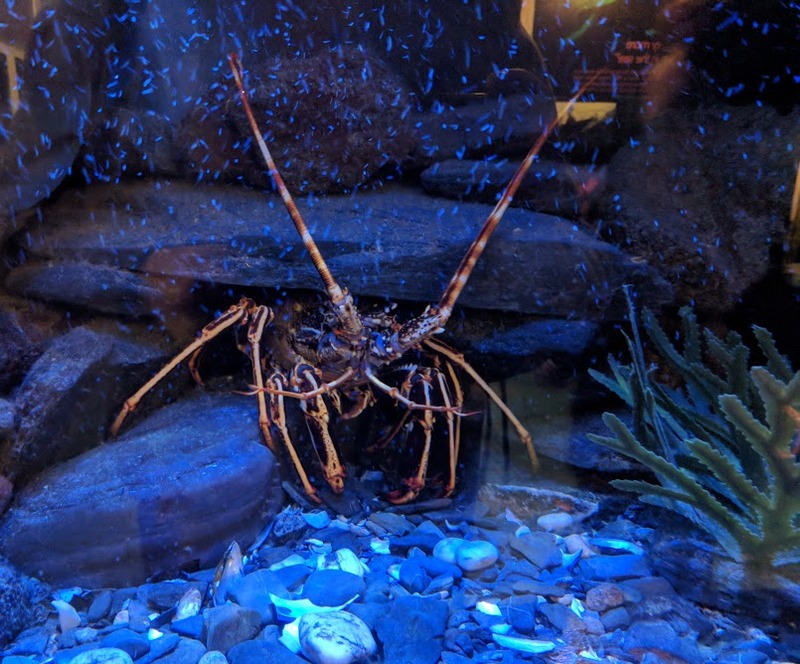 We ended up adopting our own lobster for £5. Once you're home you can track it from your computer thanks to GPS tracking. 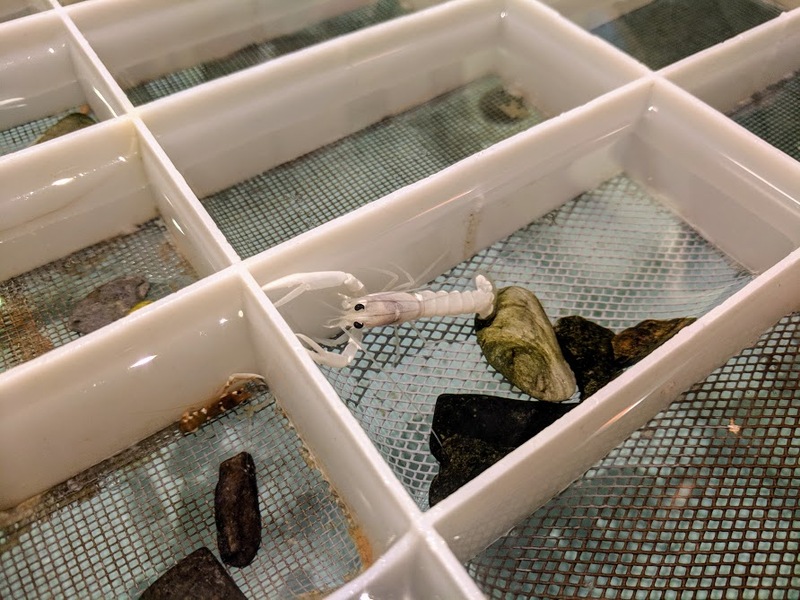 How tiny are these lobster! Before I visited Amble last year I had no idea they started life so small. They love to fight and eat each other too! 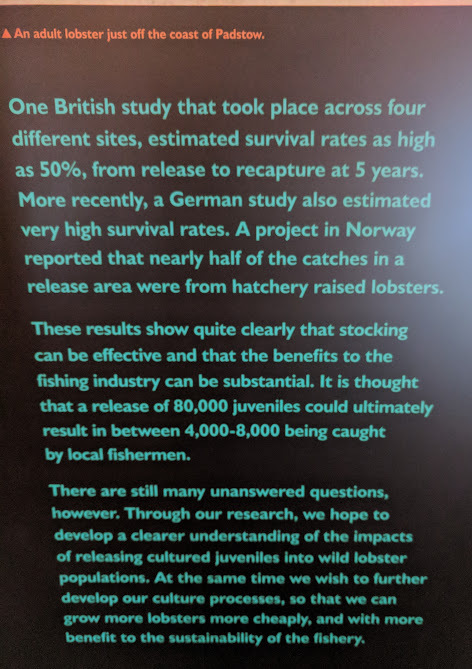 Padstow Museum is just across from the Lobster Hatchery but my three didn't want to visit so I didn't force it. It's free to visit so might be worth a look in. 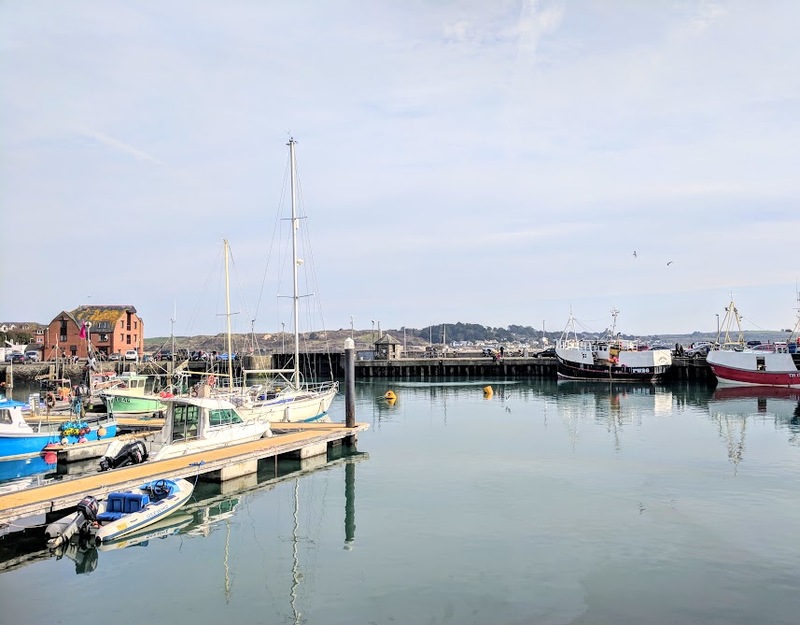 Padstow Harbour is beautiful. The views out to sea and across to Rock (where Gordon Ramsay has a house) are stunning. You can catch the ferry over to Rock for around £4 per adult or take one of the many boat trips on offer too. Dolphins and other wildlife are often spotted here. 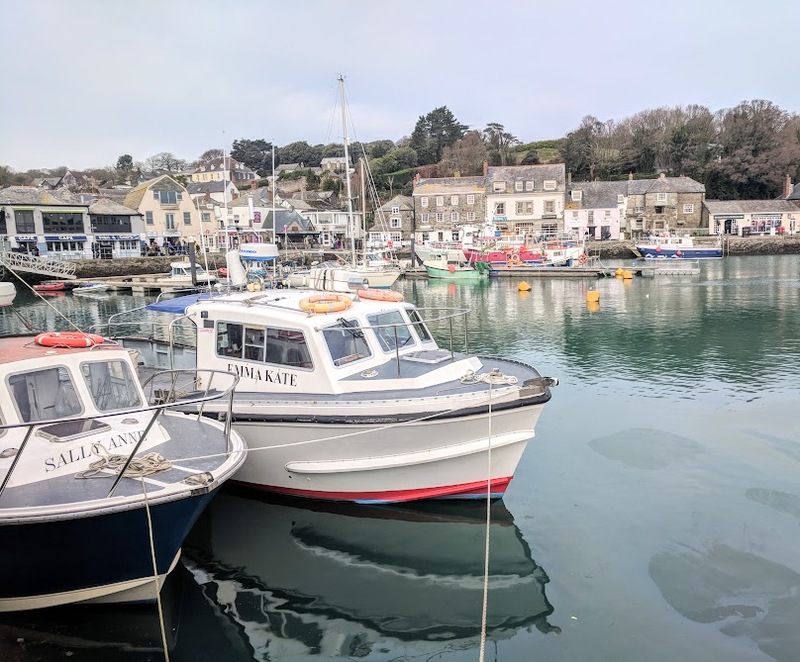 Part of the harbour is very much still a working harbour and you can watch the fishermen and lobster pots in action too. 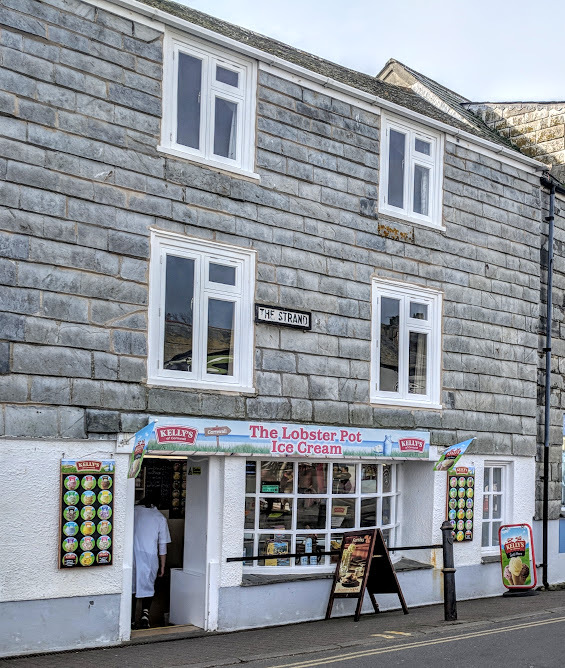 You are spoilt for choice when it comes to ice cream in Padstow. 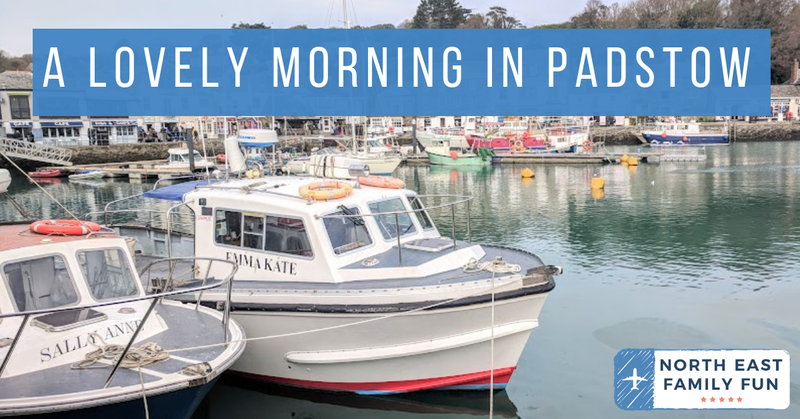 There are lots of cute little cafes and parlours to choose from around the harbour. It was pretty mild during our visit so we enjoyed and ice cream by the harbour and sat and listened to the buskers. It was lovely. 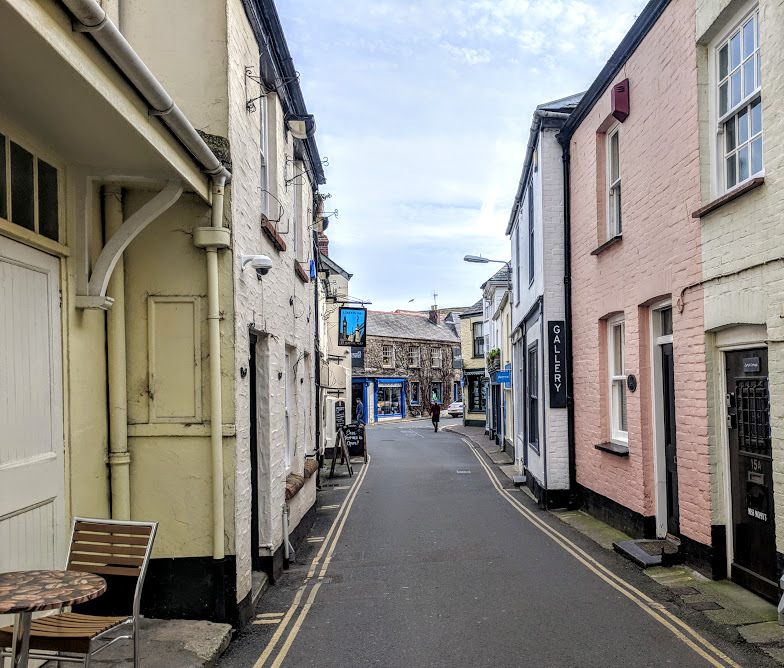 Padstow is very dog-friendly and at times it felt as if we were the only ones there without a four-legged friend. It felt like most dogs here were on a little day out and they were the centre of attraction with passers-by petting them and giving their bellies a tickle. There are dog boutiques and dog ice creams for sale here too. Definitely doggy heaven. 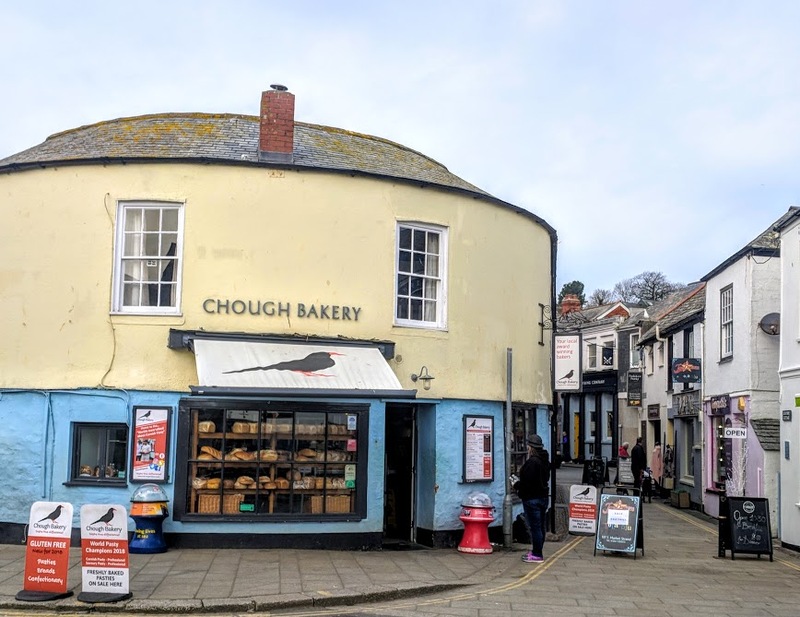 When I mentioned I was visiting Padstow on my Social Media, pretty much everyone told me to visit the world-famous Chough bakery. 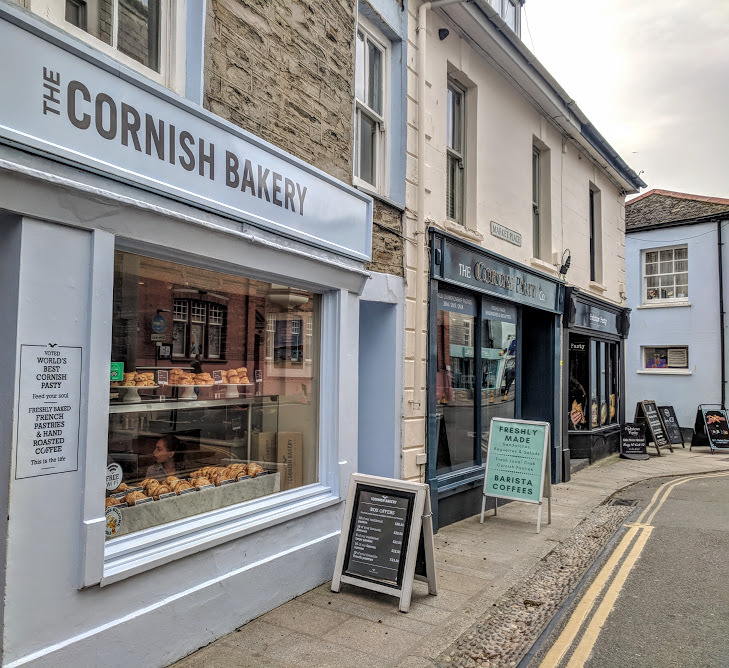 You can buy Cornish cream teas made up to take away, scones, cakes and of course, their famous pasties. 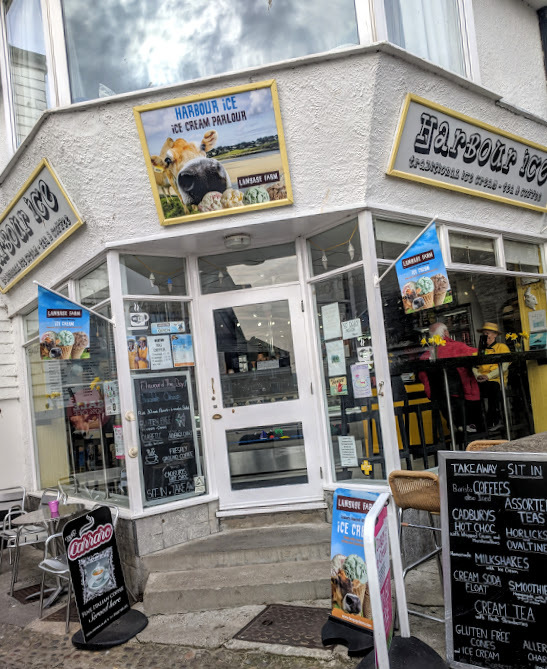 It didn't completely blow me away if I'm honest and I found it to be very expensive - they were advertising 10 Cornish pasties to take away for £38. Who spends £40 on takeaway pasties?? Padstow visitors apparently as they were flying out. We settled with a Victoria Sandwich Cake and a couple of scones which were lovely. 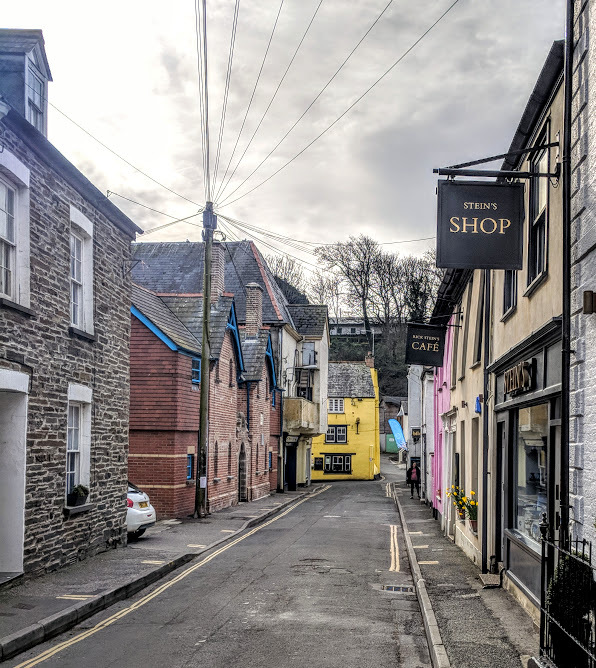 The street's of Padstow are an Instagrammer's dream. All of the buildings are pretty and colourful and in February it wasn't too busy in the morning (it did get busier around lunch). 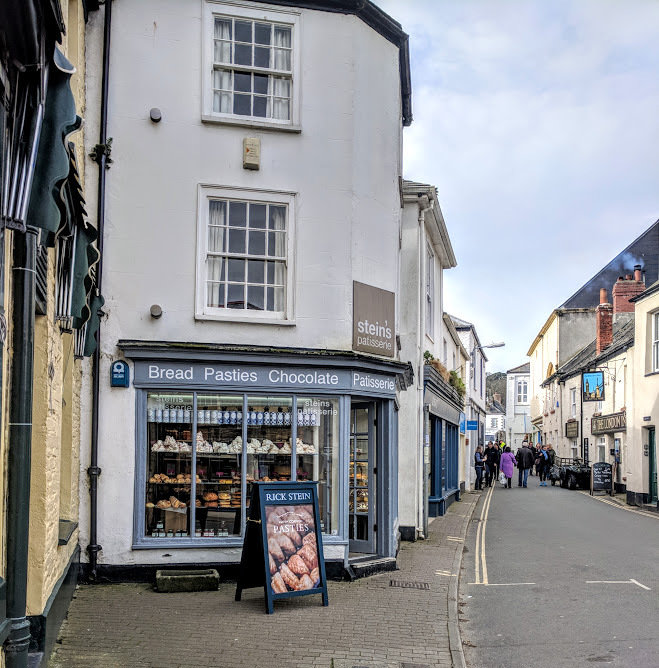 There are so many nice little shops to browse too, especially selling gifts, homeware and foodie treats. 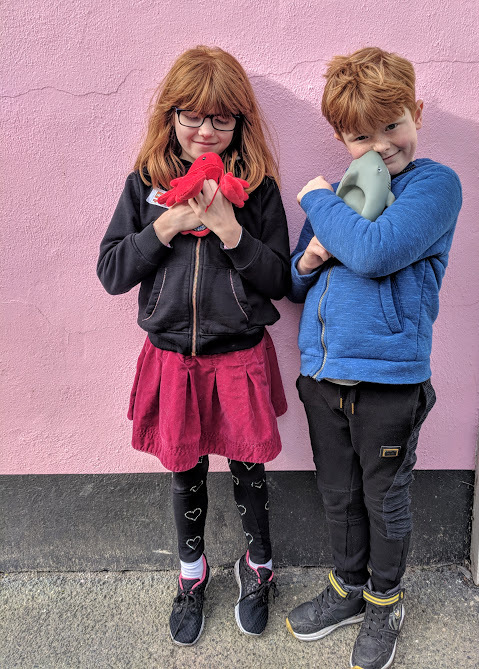 We visited the Padstow bookshop and bought the kids yet more books for our long journey back up North and a shop dedicated to teddy bears which Heidi declared as her all-time favourite shop. 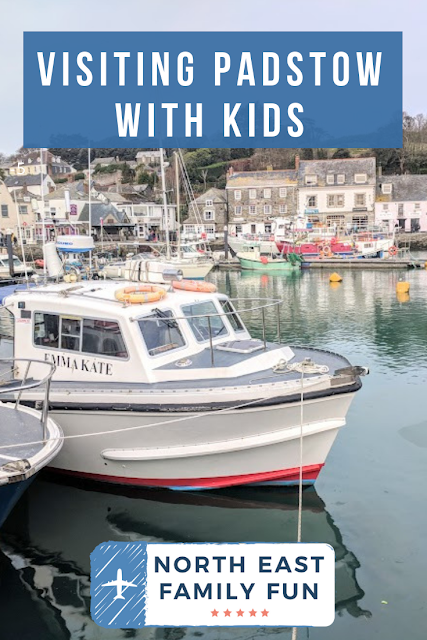 I am so pleased my children got to experience Padstow but I'd love to return for half a day without them and to have a chance to browse all of the boutiques here. Window shopping will have to do for now though and when my children have flown the nest, I'll definitely be back. We couldn't come all the way to Padstow and not have lunch at one of Rick Stein's establishments. There are probably around 15 different bistros/cafes/restaurants/shops adorned with the Stein name here and you really can't miss them. I know some people aren't a fan of PadStein but I didn't mind it. To me, Padstow and Rick Stein go hand in hand so I expected his name to be everywhere. The whole place is still oozing with charm and I don't think it's spoilt because of the Rick Stein effect. 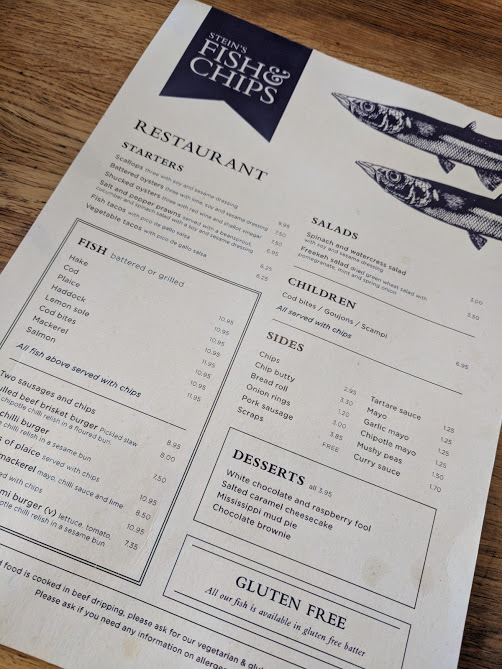 But decided to stick with a traditional fish and chip shop and visit Stein's fish and chips instead. You can eat in or takeaway here. We were there for the doors opening at 11:30am (you can't book) and were seated straight away but by 12noon there was a queue out of the door. The staff were so friendly and the kids were given activity sheets which they enjoyed. It was very relaxed and informal. At first glance, prices aren't too bad. 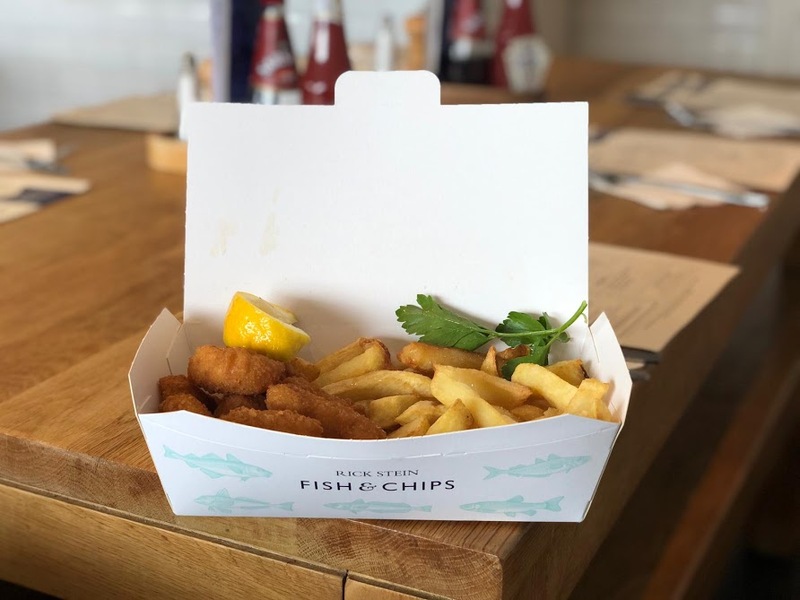 Kids meals are £6.95 and Cod and Chips is £10.95 however they really get you with the soft drinks. 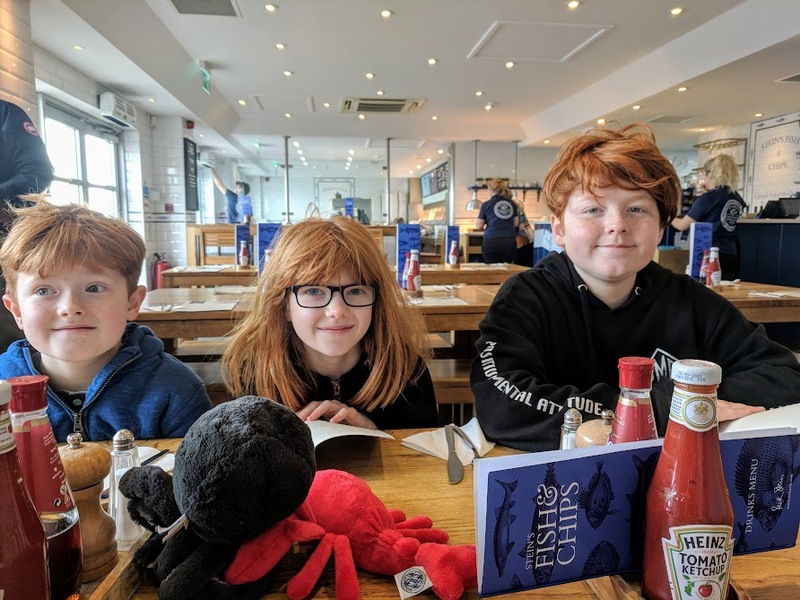 Our bill was almost £70 for fish and chips for us all (including kids meals for H, H and J) plus oysters and a round of soft drinks. Ooouch! 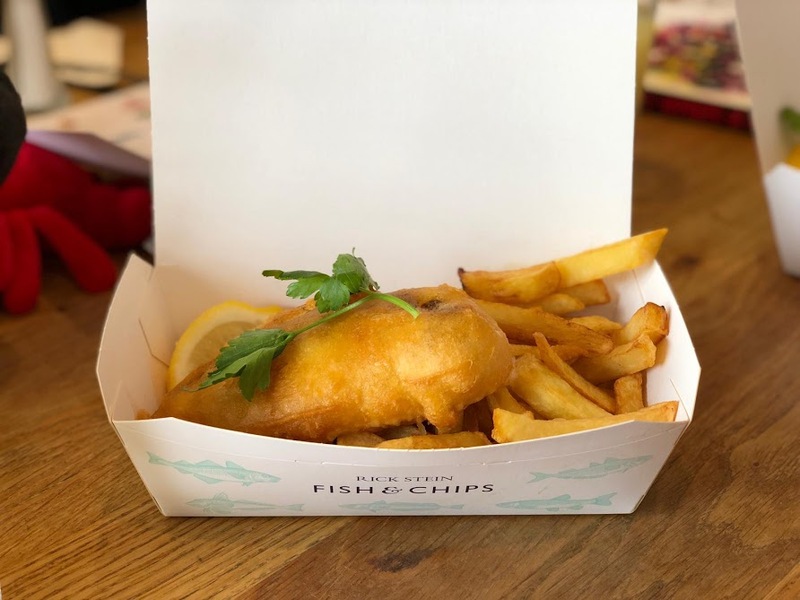 Probably the most expensive fish and chips we'll ever buy. Out meal at Coastline chippy usually comes in at under £30. For us though, it was 1000% worth it and the perfect way to round off our trip to Cornwall. 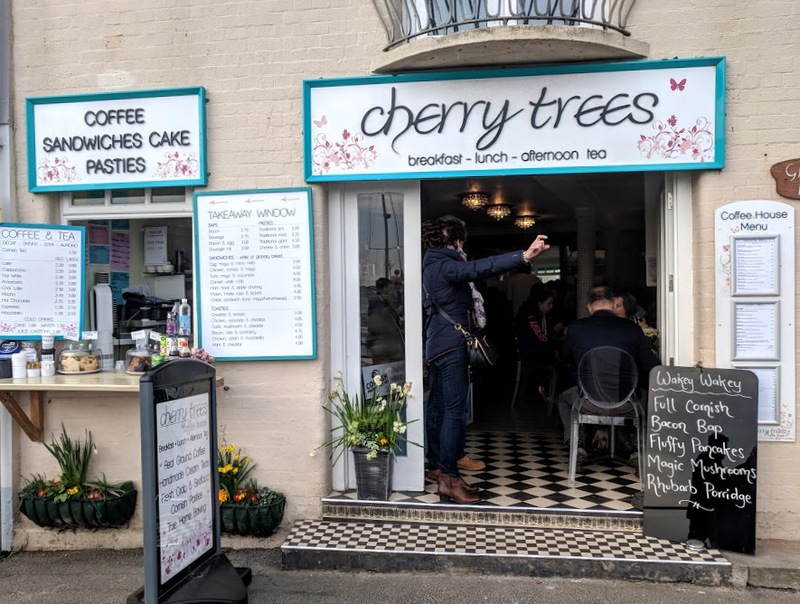 The fish and chips here really were the best we've ever had. Perfect in every way and we couldn't have asked for better. I would definitely visit here again. 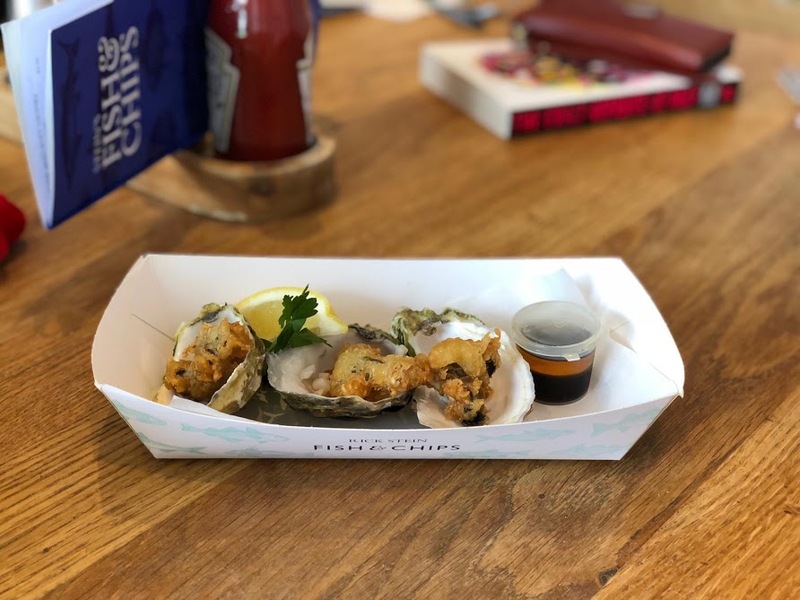 I highly recommend trying battered oysters too - these ones were served with soy and sesame and completely different to the raw oysters I've had in the past. 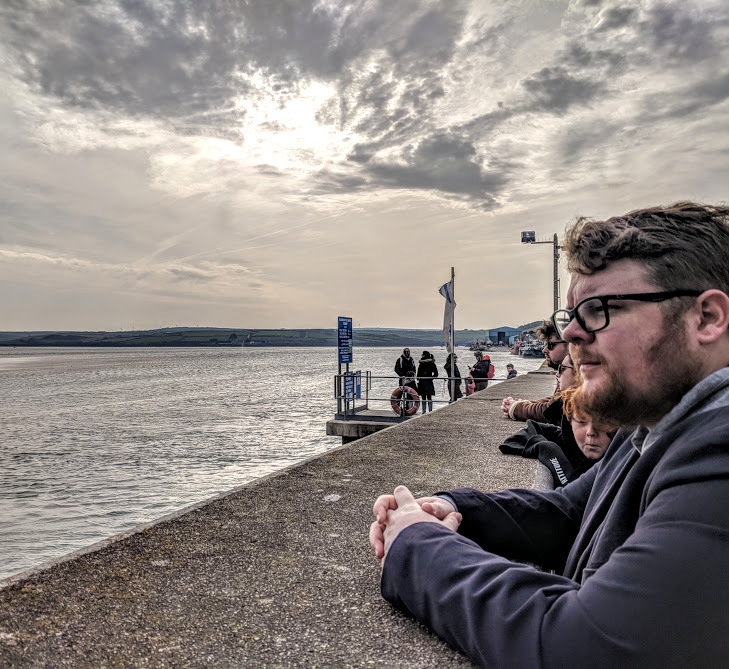 Padstow was a place I'd really built up in my head over the years and I was worried I'd be disappointed. 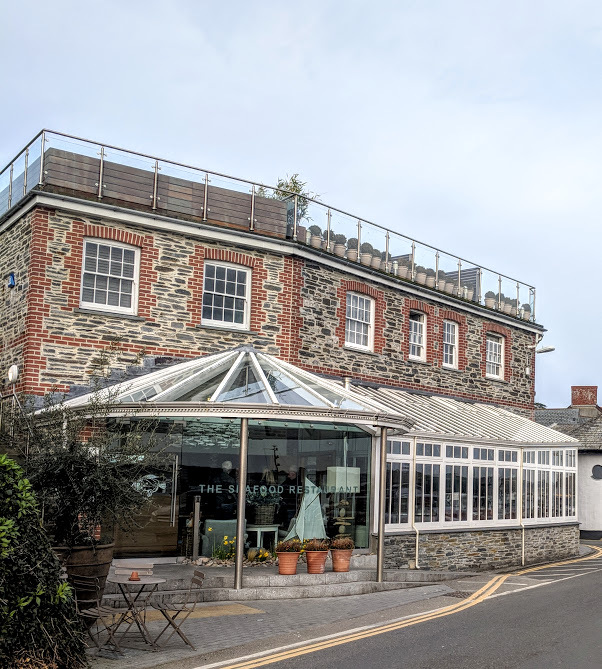 I'm so pleased I wasn't and we definitely fell in love with the place and would recommend to anyone planning a trip to Cornwall. 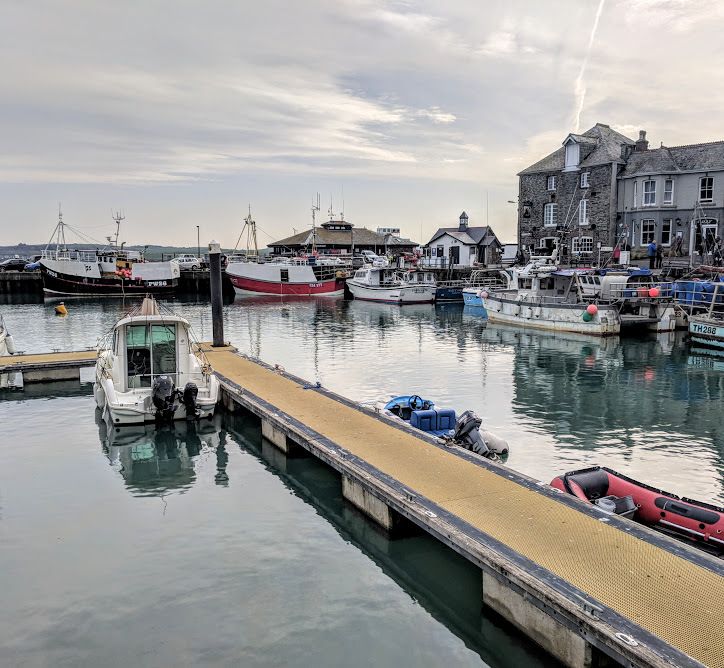 Let me know if you've visited Padstow or if a trip is on your list.